Queries and visualizations can support you at each stage of the research process. How can queries and visualizations help me? Queries and visualizations support the iterative nature of qualitative research and help you to investigate hunches as you progress through your project. It is a good idea to start running queries early on—they can help you focus on the questions you want to ask (and prompt you to code accordingly). They can also help you to determine whether you need to gather additional files of data or re-frame the questions you are asking. To start with, you may want to run some simple queries and preview the results. As you grow in confidence, you can look at building more complex criteria and storing your results in nodes. Coding queries rely on the work you have done— patchy or inconsistent coding may yield less useful results. 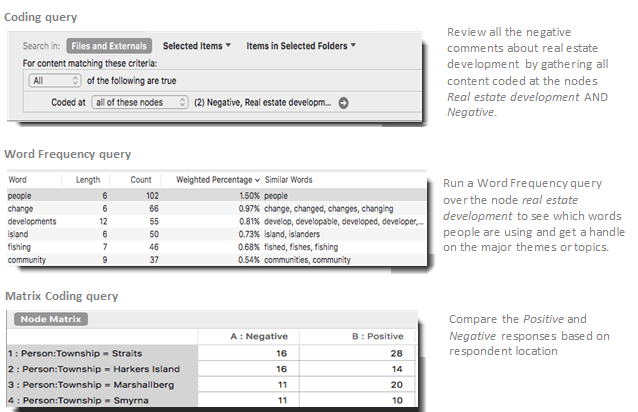 Review the query results and make a memo to describe how it contributes to your understanding. While queries and visualizations can give you different perspectives on your data, you will still need to use your analytical skills to interpret the results. Saved queries can act as 'signposts' for future investigation, set them up early and rerun them as you progress through your project. In order to keep reliable records and enhance transparency, you can import your research design materials into NVivo—for example, you might import your thesis proposal, project-related timetables, or literature related to methodology. If you have imported literature related to research methods, you could run a Text Search query to find content based on keywords or use a Matrix Coding query to explore how different authors or researchers have applied a specific methodology. Create a chart to check the spread of your respondents—is a particular demographic under-represented? Do you need to collect data from a wider range of respondents? Early on in your project, Text Search and Word Frequency queries can help you to organize your data into broad categories. For example, you could use a Text Search query to search for real estate development and automatically code all of the occurrences. 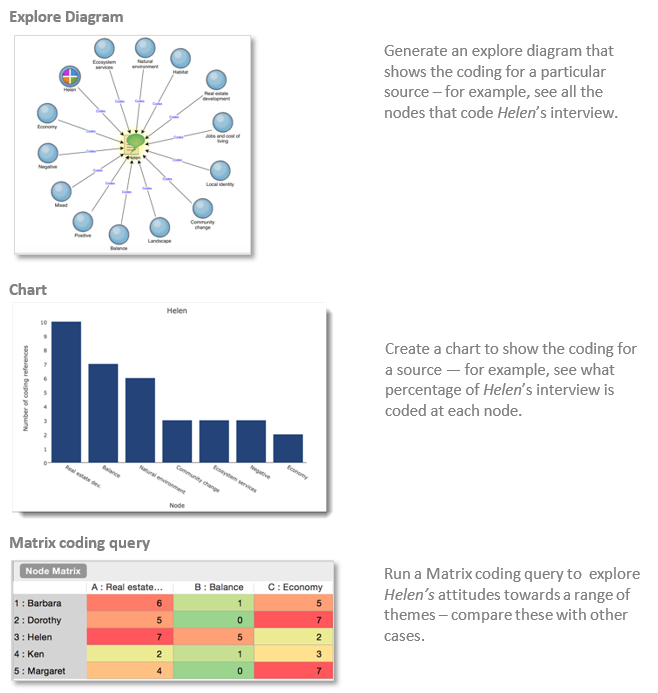 As you move into more detailed coding and continue to organize or 'segment' your data by theme—queries and visualizations can help you to reassemble and examine the themes in ways that address your research question. For example, you may want to explore the co-occurrence of themes (show me content coded at development AND water quality). Rather than being a one-step process, querying your coding is iterative—one query or visualization may lead to another as you dig deeper into your data.